Antiglomerular basement membrane (GBM) disease, caused by IgG antibodies directed against type IV collagen in the GBM, may present with rapidly progressive glomerulonephritis and/or diffuse alveolar hemorrhage. While rare in childhood, pediatric patients usually have both renal and pulmonary involvement. We report a child who presented with crescentic glomerulonephritis and severe renal-limited anti-GBM disease. The diagnosis was aided by findings of characteristic linear IgG deposits on GBM on immunofluorescence on kidney biopsy and high titers of anti-GBM antibody. As patients with renal-limited disease and severe renal failure usually do not recover renal function despite aggressive immunosuppression and plasmapheresis, intensive therapy was withdrawn while continuing maintenance hemodialysis. However, the patient later developed severe alveolar hemorrhage that responded completely to plasmapheresis and intensification of immunosuppression. Sustained serological and pulmonary response was documented, even though renal dysfunction persisted. Our case emphasizes the utility of kidney biopsy and serology in enabling rare diagnosis in patients with rapidly progressive glomerulonephritis and the role of aggressive plasmapheresis in enabling recovery from delayed catastrophic alveolar hemorrhage. Antiglomerular basement membrane (GBM) disease is an autoimmune condition characterized by rapidly progressive glomerulonephritis, caused by transient production of circulating autoantibodies directed against the noncollagenous (NC1) domain of alpha-3 chain of type IV collagen, an intrinsic basement membrane antigen. When associated with diffuse alveolar hemorrhage, it is termed Goodpasture syndrome, a condition rarely reported in childhood. Management conventionally includes plasmapheresis combined with oral corticosteroids and intravenous (IV) cyclophosphamide for 6–9 months.,, However, patients presenting with severe renal failure requiring initiation of dialysis and/or with 100% crescents or high chronicity on histology may not recover renal function despite intensive management; the risks of immunosuppression and invasive extracorporeal therapies may outweigh the benefits, particularly if pulmonary involvement and antineutrophil cytoplasmic antibodies (ANCA) positivity are lacking. 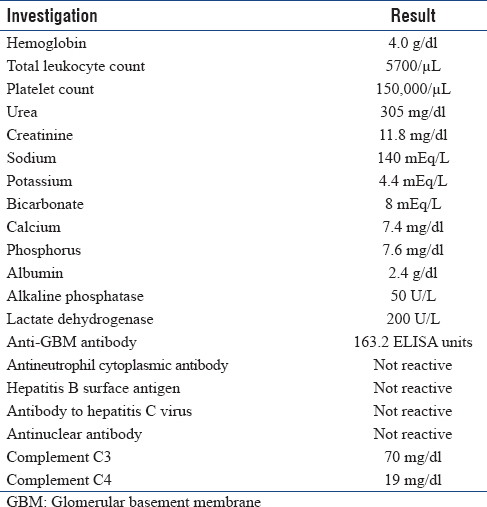 We report an interesting case of anti-GBM nephritis characterized by rapidly progressive glomerulonephritis, high antibody titers and lack of pulmonary involvement at onset, in whom early discontinuation of plasmapheresis was followed by delayed pulmonary hemorrhage that responded when plasmapheresis was resumed. A 10-year-old boy presented with progressive anasarca and decreased urine output for 3 weeks. History did not suggest systemic symptoms of autoimmune disease, vasculitides, or pulmonary involvement. Sudden onset gross hematuria was noted on the third day after admission. At presentation, he was severely anemic, hypertensive and edematous. [Table 1] shows reports of investigations. Urinalysis showed an active urinary sediment, while the ultrasound demonstrated normal-sized kidneys. Tests for antinuclear antibody and ANCA were negative, but anti-GBM antibody level was very high. Initial management included hemodialysis with ultrafiltration and packed red blood cell transfusion. Presuming a diagnosis of rapidly progressive glomerulonephritis, he was administered IV methylprednisone at 30 mg/kg/day for 3 days followed by oral prednisone at 2 mg/kg/day and one IV dose of cyclophosphamide at 500 mg/m 2, and underwent two sessions of plasmapheresis. Kidney biopsy revealed global sclerosis in two of 12 glomeruli, fibrocellular or fibrous crescents in the other glomeruli and patchy tubular atrophy. Immunofluorescence revealed linear deposits of IgG along the glomerular basement membrane [Figure 1]. Further immunosuppression and plasmapheresis were considered unhelpful, and the child was maintained on hemodialysis. Four weeks later, the child developed severe chest pain, cough, respiratory distress and overt hemoptysis. 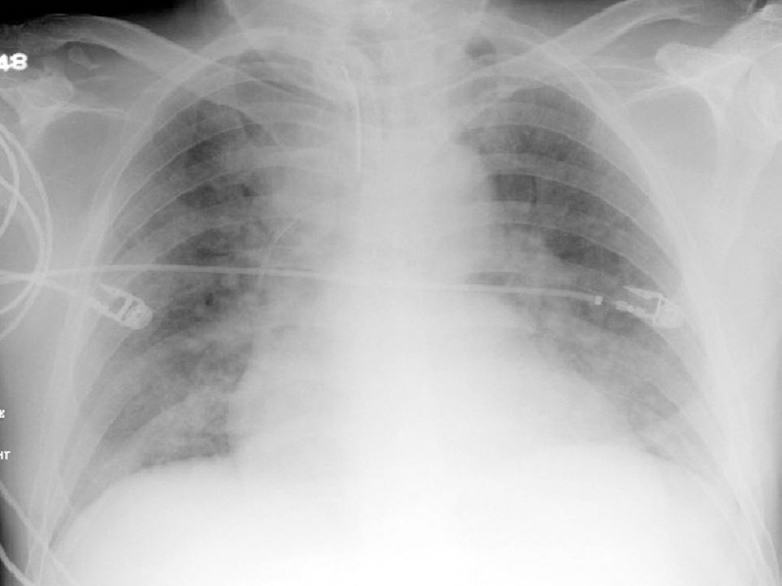 Chest roentgenogram showed bilateral infiltrates [Figure 2]. A diagnosis of pulmonary hemorrhage secondary to Goodpasture disease was made. Daily plasmapheresis was resumed along with IV cyclophosphamide and corticosteroids. There was a significant improvement with complete resolution of pulmonary symptoms after a week of initiating treatment. Plasma exchanges, continued in tapering manner for 3 weeks, were associated with progressive decline in anti-GBM antibody titers to undetectable levels. Prednisone was tapered, and azathioprine was substituted for cyclophosphamide. Immunosuppression was gradually tapered and discontinued after 9 months. Over 2 years of follow-up, the child has remained dependent on hemodialysis, but he has not had a recurrence of pulmonary symptoms. The titer of anti-GBM antibody, measured every 6 months, continues to be undetectable. The likelihood of renal response is reported to be very low in patients requiring maintenance dialysis at presentation and/or with crescents involving all glomeruli on renal biopsy. In such cases, if there are no pulmonary symptoms, aggressive immunosuppression and plasmapheresis are associated with risks that outweigh benefits in terms of renal recovery, and are therefore not recommended. As our patient had no pulmonary symptoms at presentation, there was severe renal failure requiring maintenance dialysis, and the kidney biopsy findings were unfavorable, further immunosuppression and plasma exchanges were discontinued. This was followed by delayed pulmonary symptoms with diffuse alveolar hemorrhage that responded completely, with serological remission, to re-initiation of daily plasmapheresis and immunosuppression. We report the rare occurrence of Goodpasture disease in a child presenting with severe renal-limited disease who later developed pulmonary hemorrhage. Early diagnosis was enabled by histological examination by immunofluorescence and serology for anti-GBM antibodies in a setting of crescentic glomerulonephritis. Our case highlights the role for aggressive plasmapheresis and immunosuppression in preventing and treating catastrophic pulmonary hemorrhage and enabling serological remission, even though kidney function could not be salvaged. Pusey CD. Anti-glomerular basement membrane disease. Kidney Int 2003;64:1535-50. Williamson SR, Phillips CL, Andreoli SP, Nailescu C. A 25-year experience with pediatric anti-glomerular basement membrane disease. Pediatr Nephrol 2011;26:85-91. Bolton WK. Goodpasture's syndrome. Kidney Int 1996;50:1753-66. Madore F, Lazarus JM, Brady HR. Therapeutic plasma exchange in renal diseases. J Am Soc Nephrol 1996;7:367-86. Couser WG. Rapidly progressive glomerulonephritis: Classification, pathogenetic mechanisms, and therapy. Am J Kidney Dis 1988;11:449-64. Levy JB, Turner AN, Rees AJ, Pusey CD. Long-term outcome of anti-glomerular basement membrane antibody disease treated with plasma exchange and immunosuppression. Ann Intern Med 2001;134:1033-42. Lazor R, Bigay-Gamé L, Cottin V, Cadranel J, Decaux O, Fellrath JM, et al. Alveolar hemorrhage in anti-basement membrane antibody disease: A series of 28 cases. Medicine (Baltimore) 2007;86:181-93. Kidney Disease: Improving Global Outcomes (KDIGO) clinical practice guidelines on glomerulonephritis. Kidney Int Suppl 2012;2:139. Donaghy M, Rees AJ. 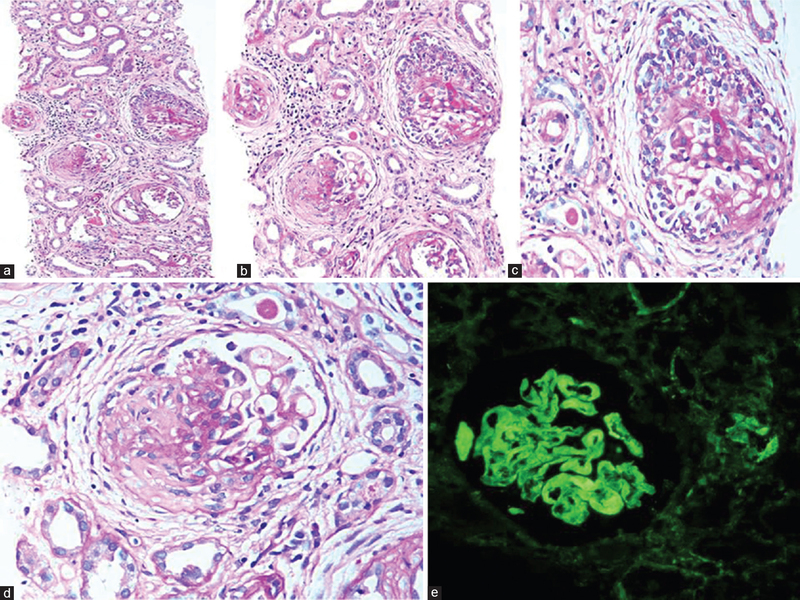 Cigarette smoking and lung haemorrhage in glomerulonephritis caused by autoantibodies to glomerular basement membrane. Lancet 1983;2:1390-3. Savage CO, Pusey CD, Bowman C, Rees AJ, Lockwood CM. Antiglomerular basement membrane antibody mediated disease in the British Isles 1980-4. Br Med J (Clin Res Ed) 1986;292:301-4.